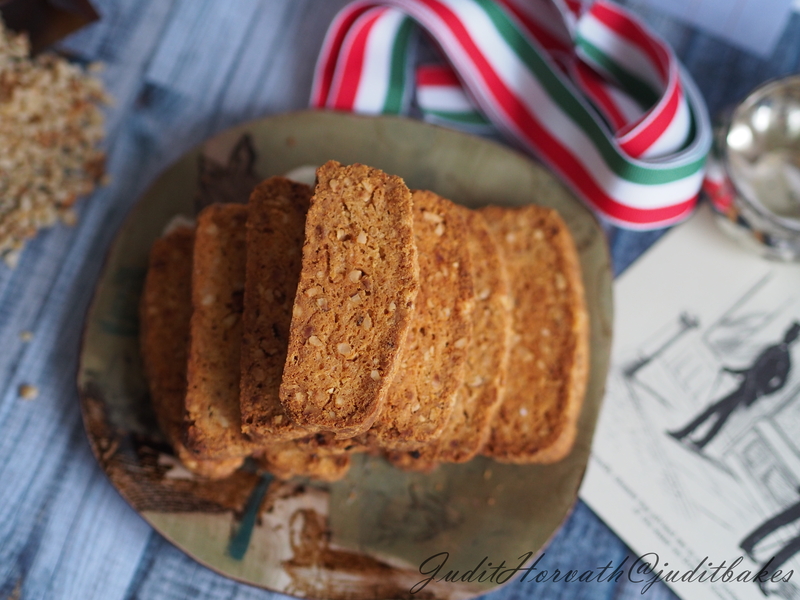 Savour the Party: Salty Cheddar, Hazelnut and Paprika Biscotti | When Judit bakes...bread and better.. 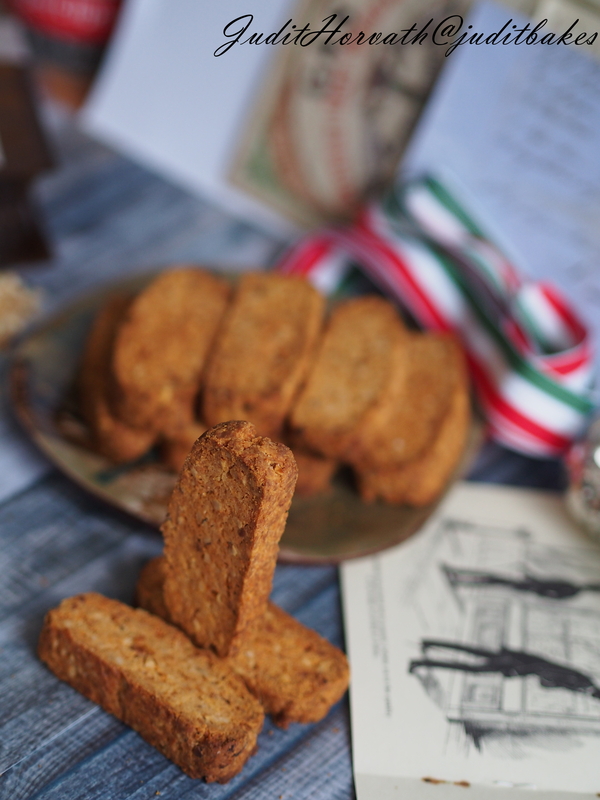 The humble biscotti, just like many other old-fashioned biscuit-type bakes, for example the ship’s biscuits in the United Kingdom, was originally made as a “long-shelf-life” food for travelers, being very dry and containing no fats and was carried to their battles by the Roman Legions. There are references to Richard the Lionheart setting out from England in 1190 with his ships suitably stored with ‘biskit of muslin’ (made of barley, rye and bean flour). Ships at the time of the Armada in 1588 had a theoretical daily allowance of 500 g of biscuit, ‘one pound daily of good, clean, sweet, sound, well-baked and well conditioned wheaten biscuit’ as it was regularized by Samuel Pepys.Today’s the ‘biscotti’s are quite different from the original versions, and have become a popular accompaniment of coffee-based hot drinks and a in its classic varieties with vine.The Roman biscotti were convenience food rather than pleasurable treats for leisurely diners. The unleavened, finger-shaped wafers were baked first, then cooked, finally completely dried, making them durable for travel and nourishment for long journeys. 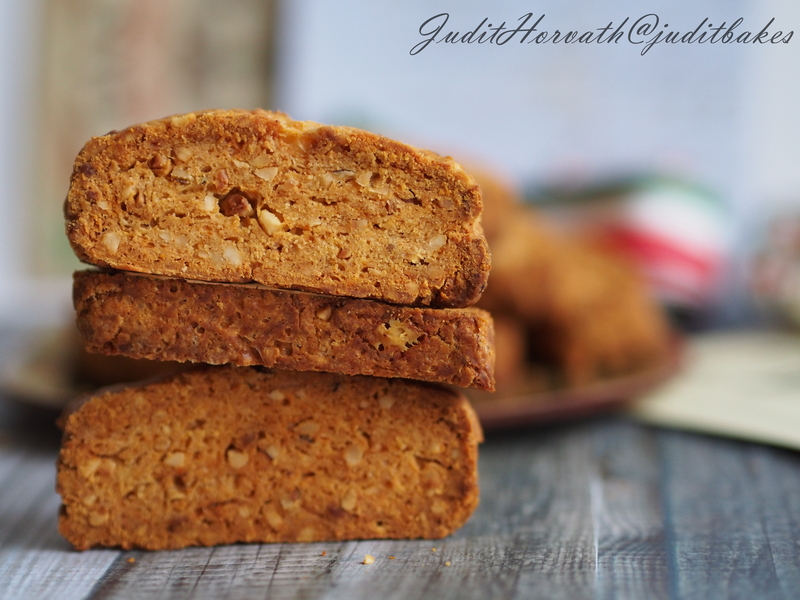 Today’s biscotti recipes still keep the old method of double process, being baked twice. The word biscotti is derived from the Latin “biscoctus”, meaning twice baked or cooked: the dough is formed into logs, baked, cooled and baked again. 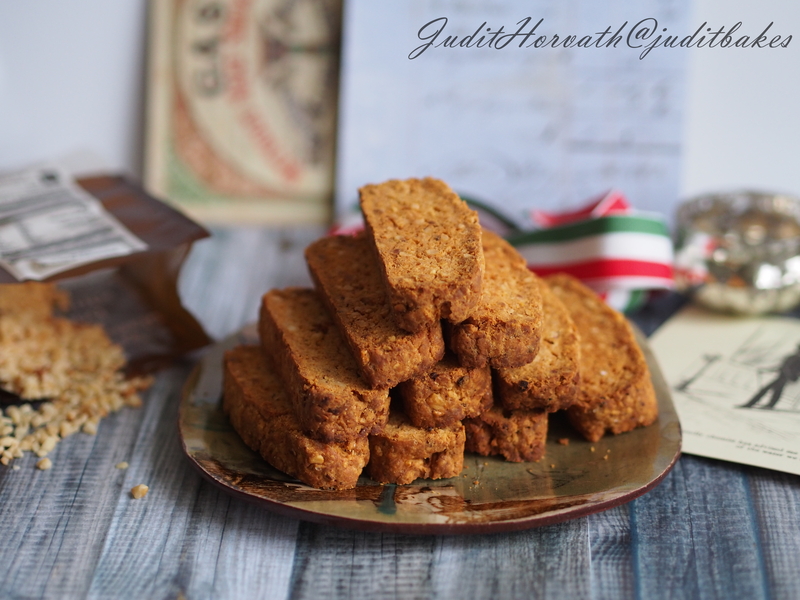 Given the fact that I am unsure of old-fashioned biscotti’s seductive qualities, I invite my house guests with less hard, more appetizing, less boring, more flavoursome, both sweet and savoury varieties. Preheat oven to 180 degrees C and line a baking tray with parchment. Mix the eggs and cheese vigorously until yellow and thick, about a minute. Add the flour, baking powder, salt, paprika and hazelnuts and just integrate the dry ingredients, do not overwork. Turn the dough out onto a lightly floured surface and gently knead it until it holds together . Shape the dough into a flat log, transfer to the prepared baking tray. Bake until the log begins to colour and is firm to the touch, about 20 to 25 minutes. Cool for about 10 minutes, then cut into rather thick slices. Lay the biscotti flat on the baking tray and bake until crisp and toasted, 12-15 minutes; turn and toast the second side for another 10 minutes. Cool completely before serving. 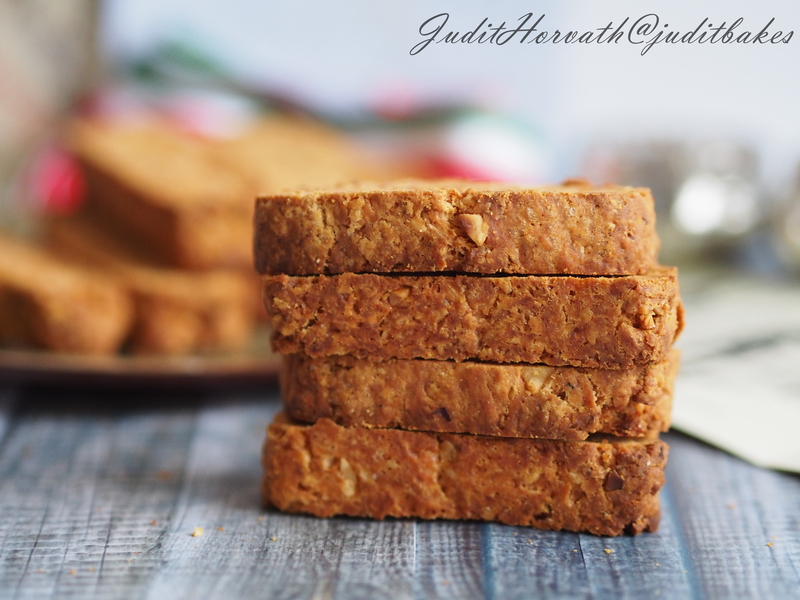 This entry was posted in Baked treats, Baking powder, Biscuits and Cookies, Flatbread, Flavoured breads, Just Everything, Savoury bakes, Special flours and flavours, Treats for Life and tagged biscotti recipes. Bookmark the permalink. I love the look of this-cheese does make most things better as well!